A valuable source of vitamins and minerals, mustard seeds can do wonders for our health. Not only are they rich in calcium, a mineral of crucial importance for a strong bone frame, but they also provide great antioxidant protection due to a high manganese content. Mustard seeds are great for spicing up various dishes and even as a condiment, they are a rich source of Omega-3 fatty acids, magnesium and potassium, an incredibly heart-friendly combination of nutrients. Also, the high amounts of selenium found in mustard seeds help regulate thyroid gland activity and prevent metabolic problems associated thyroid hormone disorders. Mustard seeds come from the mustard plant, which is a close relative of broccoli, cabbage, cauliflower and Brussels sprouts, all members of the Brassicaceae family. The mustard plant thrives in temperate climates and, just like cabbage, it adapts wonderfully to colder weather. 1) Yellow mustard seeds, also known as white mustard seeds (Brassica alba). This variety has yellow, light brown or beige seeds. 2) Brown mustard seeds (Brassica juncea), also called Chinese or Indian mustard. 3) Black mustard seeds (Brassica nigra). Irrespective of their color, mustard seeds are a worldwide famous spice (condiment) and accompany numerous dishes from hot dogs to barbecue, Caesar salad and more pretentious recipes such as mustard honey glazed ham or asparagus and crab salad. What do mustard seeds taste like? While white mustard seeds have a mild taste, black mustard seeds are considerably more pungent in flavor. The darker the variety, the more volatile essential oils it contains. Herbs and spices contain natural compounds called volatile oils which give a unique flavor to the plant and its components. Black mustard seeds contain sinigrin, while white mustard seeds contain sinalbin, and when crushed, the two compounds are released and give the seeds their pungent aroma. Aside from flavor, mustard seeds boast truly wonderful health benefits. For instance, they are a good source of fatty acids such as eicosenic acid, erucic acid, oleic acid and palmitic acid. Fatty acids are essential for cardiovascular health and normal brain activity. Although nutritionists place quite a lot of stress on Omega-3 fatty acids from fish sources, it is equally important for our diet to provide us with small amounts of Omega-6, Omega-9 and other fatty acids. 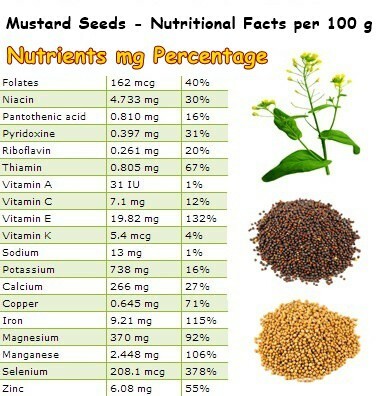 Despite having 508 kcal/100 g, mustard seeds are rich in dietary fiber: 12.2 g of fiber per 100 g of seeds. A good intake of dietary fiber is especially recommended for keeping cholesterol levels under control. The mechanism is quite simple: fiber from plant sources binds to fats or cholesterol and prevents them from being fully absorbed at intestinal level. Also, fiber-rich foods are a great source of phytosterols or plant compounds with proven cholesterol-lowering properties. Phytosterols found in mustard seeds include campesterol, beta-sitosterol, stigmasterol, brassicasterol and avenasterol. According to medical studies, such compounds can efficiently lower cholesterol levels, which may have great positive implications on cardiovascular health. Mustard seeds were highly valued in traditional medicine. They were pressed to make mustard seed oil which was applied locally to treat rheumatism and arthritis pain as well as ordinary muscle cramps. Mustard seeds act as a natural laxative. Recent research has correlated mustard pigments with a high carotenoid content. Lutein and zeaxanthin are powerful antioxidant carotenoids which basically protect our eyesight and prevent loss of central vision due to old age (macular degeneration). As it is the case with most seeds and nuts, mustard seeds are incredibly nutritious. They are an amazing source of vitamin E, a fat-soluble nutrient which protects the skin from UV radiation and the lungs from free radicals. Mustard seeds also contain more than generous amounts of B vitamins such as thiamine, folic acid, niacin, pyridoxine, riboflavin and pantothenic acid. Thiamine is great for muscle tone. Folic acid prevents neural tube defects, paralysis and even death of newborns. Niacin promotes good sleep and is a great digestion aid. For additional information on vitamins and minerals, you can take a look at the vitamins and minerals page on the menu above. I’ve saved the best part for last. Mustard seeds have an incredible mineral content. Being rich in selenium, they regulate thyroid function and thyroid hormone production. Moreover, the high iron concentration (115%) is efficient against anemia and ensures the proper oxygenation of tissues (a.k.a. more energy in muscles). Magnesium (92%) and potassium (16%) support heart activity, normalizing heart rate, regulating blood pressure and supporting overall heart muscle function. Magnesium supports the activity of important muscles, heart included, while potassium lower high blood pressure. Manganese (106%) acts as an antioxidant, keeping tissues and organs in good shape. Copper (71%) delays hair graying and eye discoloring due to old age. Mustard seeds also contain wonderful amounts of zinc (55%), a great immunity-boosting mineral. Although it is highly unlikely any of us will consume 100 g of mustard seeds per day, it is just as good for our health to eat them in smaller quantities. Be careful not to ingest too many mustard seeds or too much mustard because it can irritate the stomach lining and, in extreme cases, cause bleeding of the stomach and intestinal walls. Also, if you are not a big fan of spicy foods, you can choose the mild-tasting white (yellow) mustard varieties.